I'm in full catch up mode today, and have been all of this week. Funny how vacation really messes with you like that - I even have a twitch in my left eyelid from not enough sleep and too much caffeine. Not just vacation of course, we had all that drama last week. My dad is all good now, thanks for the well wishes. Obviously my aunt isn't recovering as quickly but that's to be expected. Nothing like family members suffering serious illnesses to make you think about whether you're own life is going well, right? Now, I certainly don't have all the answers, but in general, giving it an overall look, I'm happy and satisfied with my life. Some days I wish my job paid more, some days I'm happy that means I can make my own hours. Some days I wish the house would stay clean and organized, but mostly I'm happy about it because the mess is from my loves, John and Hawkeye. (Mostly John, Hawkeye is actually pretty neat!) So I'm sharing some tips that I think are helpful for living a satisfying life. Lose the pride. You miss out on so many opportunities if you're too prideful to take advantage of them. There really aren't too many things, experiences, jobs, people, etc. that are 'beneath you.' And if you do take advantage of them, you open yourself up to more good possibilities. You never know where a path might lead. And don't be too prideful to ask for help along your journey either. Know your personal boundaries and live within them. Which is a long winded way of telling you to say 'no' more often. You don't have to like or do things because other people want or expect you to. You don't need to go get drunk on a Saturday if you don't like alcohol, you don't need to have a kid if you don't like babies. (I'm one of these, I'll let you guess which...) Some of my other boundaries? I don't like or eat meat or seafood, I don't like complicated/extravagant/large holiday gatherings, I don't enjoy travel or flying so I almost never do it. You don't have to do everything that's popular with someone else. Live with a defined purpose. 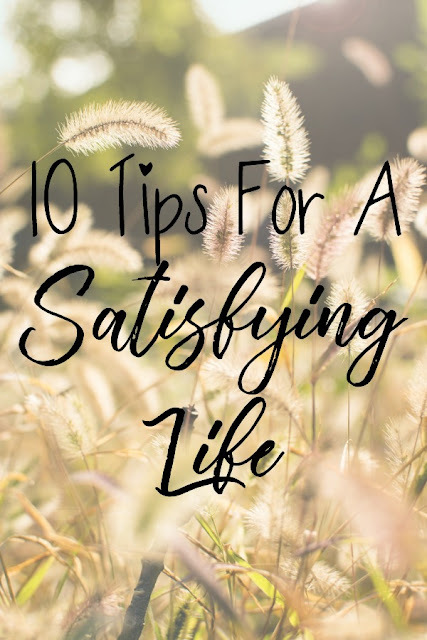 Whether it's becoming a chef, raising kids, volunteering with animals, you're not going to be satisfied until you know what your life's purpose is. Not there yet? Watch these videos from Melissa Alexandria on YouTube: one and two. Don't let impulse guide you. Impulse is a terrible way to make decisions if you want to feel satisfied with your life and the direction it's heading. Sometimes impulse can be fun, like jumping at a last minute invite to see a band, but when you're thinking long term, it's not the best way. If you impulsively decide things like how to spend your money or where to live, you're going to be left with that empty feeling when the newness of the impulsive decision wears off. This is especially true for impulsive decisions when you're feeling emotional. Bought an expensive dress and a new eyeshadow palette after a crappy day because you deserved it? We've all been there. But it's a very temporary fix that lets you down almost immediately. Don't let fear control you. Just like impulse isn't the best means for making decisions, neither is fear. You can't be afraid of failure, or doing or saying the wrong thing, or what other people's opinions will be of you. Create, don't just consume. I think one of the reasons they say 'money can't buy happiness' is because people with a lot of money are using that to consume, by means of paying people to do things for them, instead of creating for themselves. There's a sense of accomplishment when you do things for yourself, even 'basic' things like cooking, cleaning, or just working in general. When you just sit back and consume all of those things by constantly ordering in dinner or dropping the laundry all off at the cleaners, your sense of pride (normal sense of pride, not to be confused with 'too good for everyone and everything' pride) in yourself starts to disappear. When you're productive, whatever that is to you, you feel so much better about all that you're capable of. Live in the present. Dwelling on the past does absolutely nothing. You can certain reflect on something and take what you can learn from the situation, and then apply that to the future, but repeatedly replaying these memories is just going in circles and making you crazy. Thinking too much into the future isn't the answer either, because you can only plan for so much. It's so important to enjoy the present that you're currently in and appreciate each day. Evaluate your relationships. Regularly. Some people hold immense power over your mood and opinion of yourself, and you don't need to keep around the ones who make you feel bad or drained. For any reason. Distance yourself from that negativity and keep people in your life who treat you well, make you happy, and inspire you to be better. Learn self control and relinquish control of everyone around you. As someone who loves to be in control of every situation, this is the hardest for me. But the only person you can really control is yourself. Mastering self control will help with all the other things I mentioned, like not acting impulsively or out of fear. And relinquishing control of others will lift a huge burden off of you - you're not responsible for what they do. Plus you might be surprised how much someone can help and accomplish things on their own if you just give them the chance to. You don't have to be a one person show, micromanaging everyone around you. Love what you have. If you want to be satisfied with your life, it makes sense to be satisfied with what you have. If you focus on the positive and think about all you're grateful for, this comes much more easily. I'm not always great at all of the above, but when I follow these guidelines, I can feel the shift in my mood. Agree? Disagree? Let me know in the comments.